With Google making tentative steps into the price comparison market, the sector could well undergo a shake-up over the coming year. 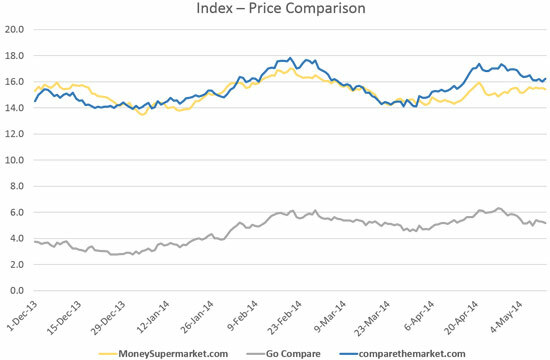 Using YouGov’s BrandIndex tool, I have assessed the main players in the market currently – Gocompare, Comparethemarket and MoneySupermarket. So competitive is the sector that the brands rely on high-profile advertising campaigns to make their mark. Using BrandIndex’s ad awareness metric (which assesses if people have seen an advert over the last two weeks) we see that the varying levels of success that the different campaigns have enjoyed in recent months. The latest MoneySupermarket campaign, featuring rapper Snoop Dogg, launched in early February. Since then, the brand’s ad awareness rating has increased by over 3.5 points. It now closely trails Gocompare, whose latest campaigns are moving away from featuring opera singer Gio Compario, and have dropped off in recent weeks, falling by 15.2 points since its highpoint in January. While MoneySupermarket has improved and Gocompare has declined in terms of ad awareness, Comparethemarket has remained steady with a third (33 per cent) of consumers recalling recently seeing a spot featuring Alexsandr Orlov the meerkat. But what difference do these the adverts make to overall brand health? Well, it’s a mixed bag. Since the start of the year, Comparethemarket shows the strongest average index score of the three (15.7). 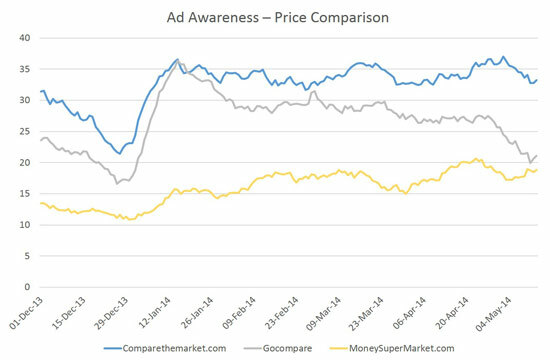 However, while it is ahead of Gocompare (5.0), its lead over MoneySupermarket (15.2) is small, indicating that its edge in advertising is crucial. The entrance of Google could shake-up the entire sector, not least because as the dominant search engine it holds great sway over where consumers buy things. This is why strong brand awareness and strong advertising is crucial for the others. Unless consumers come to their devices knowing which site to go to, they could lose out to the search giant.